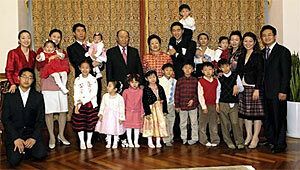 MRS. HAK JA HAN MOON - World Leader for Peace, Devoted Wife, Mother and Grandmother. Behind every great man is a great woman, and Reverend Moon is no exception. Married to Reverend Moon in 1960, Mrs. Moon has been at Reverend Moon’s side ever since; she is equally dedicated to bringing about world peace and a culture of God-centered families. She also the mother of 14 children and more than 40 grandchildren. In the last decade, Mrs. Moon has become a world leader in her own right, undertaking world speaking tours addressing large audiences on six continents, meeting with heads of states and leaders of society to build an interreligious movement for world peace at the most critical time in world history. Called “the incomparable Mrs. Moon” by Arnaud de Borchgrave, Editor-at-Large of The Washington Times, Mrs. Moon is a woman of unusual beauty, grace, intelligence, dedication and mother’s heart. Three Generations Work for Peace: Reverend Moon enjoys the distinction of a religious leader who has inspired the active support of three generations of his family: his wife, his children and his grandchildren. His legacy is being carried on through accomplished adult children and grandchildren who are dedicated to the ideals and activities of a world of peace through God-centered families. Reverend and Mrs. Moon’s adult grandchildren continue the family tradition of living for others. In 1973, Reverend and Mrs. 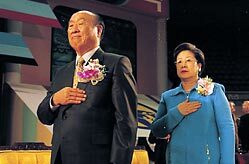 Moon made their primary residence in the United States, settling with their children in Tarrytown, Westchester County, New York. Six of their 14 children were subsequently born in America. The children attended public and private schools nearby. According to Reverend Moon’s vision of a future world that combines the best of East and West, it was important for him that his children grow up in and love America, the leading country of the West. The 1970s and 1980s were times of intense religious persecution in America against Reverend Moon and his growing faith. It wasn’t an easy time to be a son or daughter of Reverend Moon. The Moon children faced daily rejection and ridicule of both their father and their faith. Adding to their difficulties, due to heavy worldwide responsibilities, Reverend and Mrs. Moon were often traveling and not able to be at the side of their children. In short, the Moon children could not enjoy a normal childhood. Nevertheless, today they are successful adults with their own families and achievements in education, religious work, social service, sports, music and business. The Moon children have graduated from some of the United States' most prestigious schools including Harvard University, Columbia University, Vassar College, New York University, Mount Holyoke College and Boston University. Remarkable for their multiple talents, many are outstanding students and several are accomplished athletes and musicians. 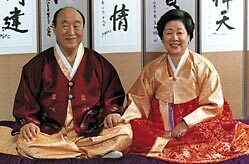 Son Hyun Jin participated in the Olympics twice in equestrian sports, several sons have black belts in martial arts, and were star players in high school in sports including football and lacrosse. The eldest son, Hyo Jin, has an Asian rock band and is a prolific song writer, singer and rock musician. Other children are accomplished on the piano and cello. Some children have won awards for their art. The Moon children regularly delight worldwide audiences with entertaining renditions of popular American songs. At the top of their repertoire are Elvis Presley songs including Blue Suede Shoes and If I Could Dream. As professionals, their careers include religious work, social service and business, and being dedicated parents. First there was Reverend Moon. Now there are several dozen “Reverend Moons”: these days three generations of his family are carrying out his work for peace. In 2005, 2006 and 2007, Reverend and Mrs. 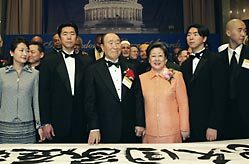 Moon with their adult children and grandchildren undertook challenging world speaking tours to 120 nations and hundreds of cities.The purpose: to rally people everywhere at a critical time in world history to work interreligiously for world peace and God-centered families. 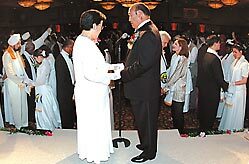 Their adult children and grandchildren participated as leaders and speakers in the intense tour schedule of one nation per day, where they were warmly received by large audiences on six continents.